1st State BIKES: 'Parkettes' on Main Street in Newark? Newark Post -- One complaint Downtown Newark Partnership Administrator Ricky Nietubicz said he often hears about Main Street is the lack of public seating areas. “We really don’t have any on Main Street,” he said. To combat the problem, the DNP’s design committee looked to Philadelphia, where parkettes, also called parklets, have recently sprung up across the city as places for pedestrians to sit and hang out. The parkettes take up one or more on-street parking spaces, typically extending out from the sidewalk and spanning the width of the parking space, and are a growing trend in cities like Los Angeles, San Francisco and Seattle. Poster's note: Who wouldn't support the concept, and desire to sit or dine out on Main Street? But the noise from modified motorcycles, muscle cars, and pickup trucks is so loud, it can gives folks an earache even on the sidewalk - never mind inches from the lane. Until police start enforcing noise laws, a better use would be to install a few bicycle parking corrals to help reduce clutter on the sidewalk and against trees. It would also provide the same benefit of greater pedestrian visibility. 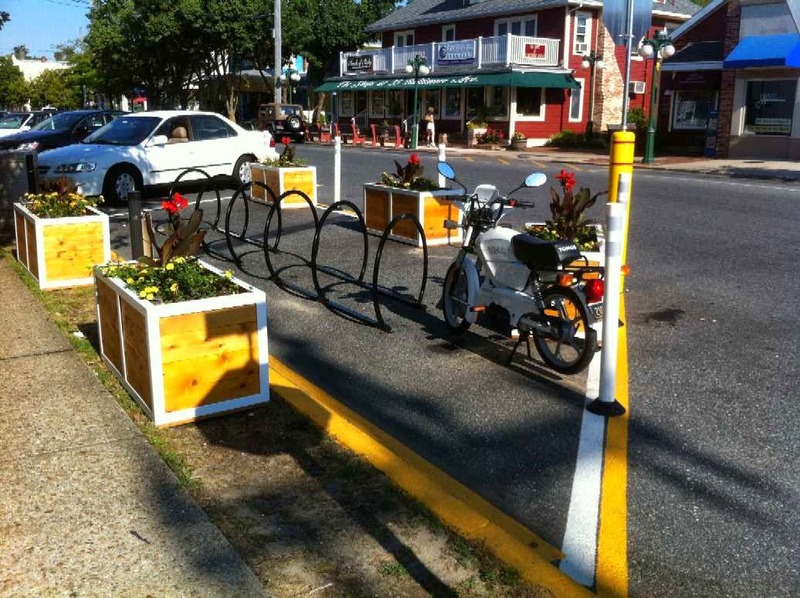 With virtually no vehicle noise law enforcement in Newark, we recommend a variation of the above bicycle parking corral in Rehoboth - designed for parallel parking. It would have many of the same pedestrian safety benefits as a parkette, while reducing sidewalk bicycle clutter and damage to trees. I for one, I do not think that this is a good idea. Any enjoyment of sitting outside would be ruined by the traffic noise, the stink of exhaust, and the traffic flying by, just inches away, sometimes at high speed. Being at the curb and essentially alongside traffic is very frightening. A more forward thinking approach would be to follow the examples of Times Sq, NYC, and Charlottesville VA among others, who created motorized traffic-free spaces. Newark's Main Street could do this, easily. The parking spots would be better used to create bike parking corrals. Main Street is in dire need of more bike parking. With the massive new parking garage that Newark is planning to build, the focus should now shift on creating bike corrals, not sitting areas. have lived in Newark many years. I came here after being born, raised, and had lived most of my life in the Bronx, NY. Walking, public transportation, and cycling are not things that I embraced to fit in or be fashionable, they are the things that I know, and have done all my life. Newark seems to be going backwards, in my opinion - instead of trying to create a greener, more sustainable environment by encouraging more cycling and walking, it is focusing on increasing car traffic and trying to attract people from further afield. As a bicycling and pedestrian Advocate, I have tried to make a difference, and I'd love to see the City embrace the changes that would encourage less motorized transportation, not more. It is possible! Having said that, I have also seen positive steps - the new sharrows are very encouraging! I am grateful for the efforts put forth by the Newark Bicycle Committee, and I appreciate the improvements, and hope that we can build on them. But we must work together, and be brave enough to have the vision to make changes that will make a difference.